The health and safety of thousands of Native American students and their families continue to be at risk as the federal agencies that oversee Indian education and health lag in fixing serious problems, according to a government report. The Government Accountability Office identified 34 high-risk areas among the Bureau of Indian Education, Indian Health Services and the Bureau of Indian Affairs in its May report. The findings, included in a status report to the Senate Committee on Indian Affairs, detailed agency shortfalls put the health and safety of Native Americans served by federal programs at risk, exposing them to poor conditions at BIE schools and inadequate health care at IHS hospitals. The GAO also reported that the Bureau of Indian Affairs mismanages Indian energy resources held in trust. The agencies that serve tribes, a majority located in the West, have implemented some of the GOA recommendations but several dozen remain unaddressed. The report reveals the scope of the problems within the agencies serving Native Americans. Those agencies have a history of inadequacies and face funding woes that could make problems even more difficult to fix. In BIE schools, auditors found aging boilers and elevated levels of carbon monoxide. In one instance, the lack of oversight resulted in $1.7 million that was improperly transferred to offshore accounts, according to the GAO report. At IHS, which oversees clinics and hospitals that serve 2.2 million Native Americans, auditors found inadequate funding to pay for outsourced health care that delayed diagnosis or treatment; at one facility, it took too much time to receive an initial exam, sometimes as long as four months. Auditors also found that more than 1,550 employment vacancies — including doctors, nurses, dentists and pharmacists — combined with significant turnover in leadership affecting the quality of care. The GAO also cited concerns about the BIA’s management of energy resources, noting, for example, that it took the agency as long as eight years to approve extraction permits for the Southern Ute Indian Tribe. The delay caused the tribe to lose more than $95 million in revenue. Despite the outstanding problems, the federal agencies that serve Indian Country say they are working to implement solutions. The BIA and BIE have begun searches for a qualified workforce to handle or create accounting procedures in BIE schools or creating a documenting process to better track oil and gas leases. Both remaining agencies say they will implement the GAO recommendations by September 2018. 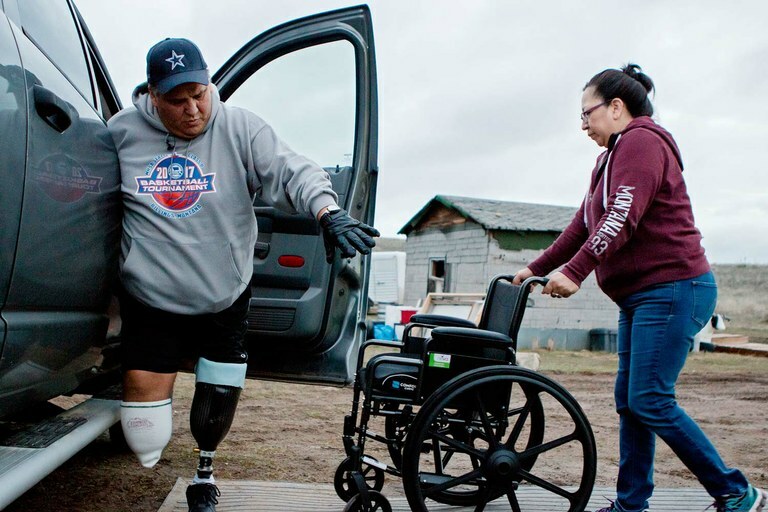 Jay D Old Mouse of the Northern Cheyenne Tribe in Montana has been coping with diabetes for more than twenty years and has lost both his legs from symptoms of the disease. Indian Health Services focuses most of its funding on treating symptoms rather than investing in prevention. Specific areas IHS is working on include improving retention of experienced, qualified staff, and providing better training to both new and existing staff, in addition to wait times at hospitals and clinics. The agency is also working to increase oversight. Buchanan said IHS is on track to address GAO’s recommendations by the end of 2017. Congress, however, may have an uphill battle as President Donald Trump’s proposed 2018 budget cuts $370 million for BIA and BIE, and more than $300 million for IHS.